Who is the busiest Ground SAR team in BC? I’d like to preface this post by saying that by no means should these numbers reflect the relative value your SAR groups represents to BC or your community. The number of people who get lost and need rescue is purely a function of the popularity of your area, and the population living there, and not a reflection on your abilities, readiness or usefulness. Even if you NEVER rescue anyone, you are there training and ready in case the worst happens. I wouldn’t drive without my seatbelt, and neither would I want to do without any of the 80 SAR groups in BC. In fact, looking at these numbers I think that some of these teams might consider splitting their regions into two in order to better serve the people who live there – there is such a thing as too busy. A few years back I undertook a project to download and convert all of the Emergency Management BC Incident Summaries into a format better suited for analysis. The summaries are in PDF format. I downloaded these, converted them to text and used a variety of specialized tools to convert them into a single spreadsheet. At one point I made a web site and let people query the data themselves, but I took that down since nobody was using it. However, this did let me publish a nice set of charts showing the distribution of SAR incidents both geographically and time. This time I went back to the source and added the years 2011 and 2012, bringing the data set to a full decade of data. The goal of today’s analysis is to try to track which teams respond to the highest number of incidents, however I have to add a few caveats. The analysis uses the name of the team mentioned in the incident summary. This can be a slightly inexact match, so some incidents may not be counted. If the data entry person typed the team name wrong, it is possible that a few incidents will not be counted. Incidents where more than one team responded will be counted against all of the team’s totals. The sum of all teams responses will therefore be larger than the total number of incidents. Many incidents, particularly in busy areas, are “false starts” where the subject is not in fact lost. These are counted as full incidents, no attempt is made to judge the magnitude. Some teams in BC do Road Rescue. Somehow these incidents aren’t recorded in the regular incident summaries. To that end I would like to personally thank all teams who perform Road Rescue, especially my colleagues at Hope Search and Rescue who I believe never get the credit for the work they do. The call volumes I have heard are very high, and the accidents scenes can be particularly stressful with injuries and deaths. Some of these numbers were checked against SAR group records to confirm the analysis. The numbers are generally correct, but could be off as much as 10% in some cases. Given the deficiencies in the data gathering technique outlined above I think this is acceptable. The numbers presented will probably under estimate the actual number of responses for most teams. That being said, this is the only publicly available way to get access to confirmed EMBC tasks. 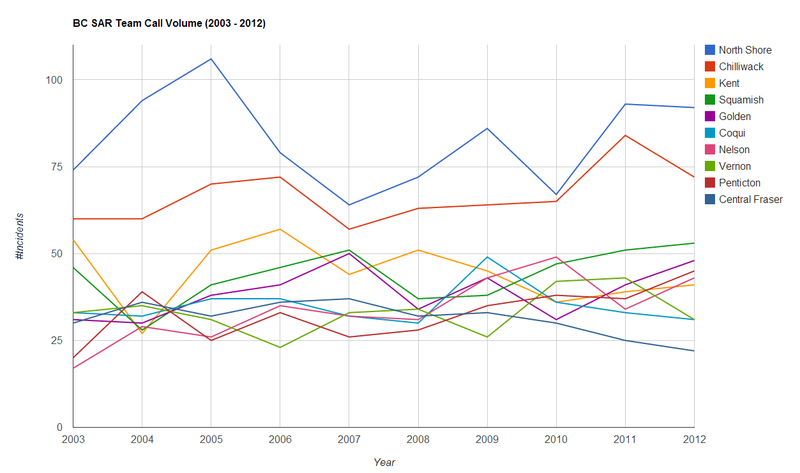 Since there are eighty SAR groups in BC, I chose to select the top ten for a chart. North Shore Rescue, with three ski hills and adjacent to the 3rd largest city in Canada is the obvious choice for the busiest SAR team in BC. Their call volume fluctuates widely between a high of 106 in 2005, and a low of 64 in 2007. Their average is 82 incidents per year, and the standard deviation (a measure of the variability in the statistic) is 13 – also the largest in BC. Chilliwack SAR is next on the list with an average of 67 calls a year, and a max and min of 84 and 57 respectively. The high call volume is out of proportion for the population they serve, but they are located in an area with access to several mountain ranges, many rivers, lakes and swift water, numerous logging roads and other backcountry hiking, hunting and fishing areas. Kent Harrison Search and Rescue is the third busiest in BC with an average of 44, but represents a cluster of SAR groups rounding out the top 10 with call volumes ranging between 31 and 45 calls per year. Each of the groups in this cluster seems to trade places with the others regularly, and Kent Harrison has the lead in the 10 year average by only one incident over Squamish SAR. The standard deviations of these teams are also similar between 4 and 9. 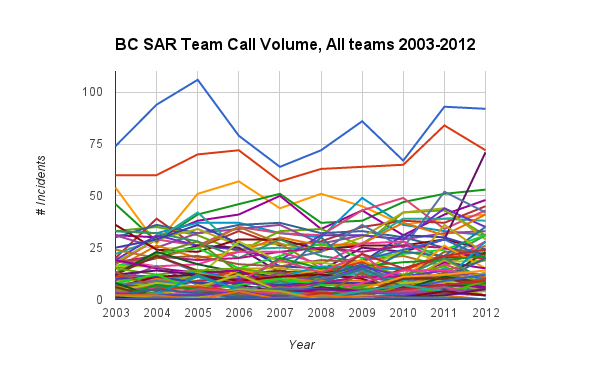 For interest, here is a chart visualizing the spread of call volumes among all of the SAR groups. This chart shows the distribution between the SAR groups, showing that the top two are clear outliers, a cluster of teams around the 25-35 mark, and many teams that have under 10 incidents per year. Of the top ten, six are in the Southwest region of the province, divided between the BCSARA Fraser Valley region and the Sea-to-Sky region. Based on my previous post on distribution of SAR incidents, this is not surprising since 36% of all incidents in BC are in this area. Nelson, Vernon, Penticton and Golden are clear hotbeds of backcountry activity, all of them having rivers, lakes, mountains, glaciers and a recreation profile that includes mountain biking, hiking, climbing, mountaineering, backcountry skiing, and sledding among the other sports. It is worth noting that Campbell River, Comox and Hope are numbers 11, 12 and 13 in call volume, followed closely by Kamloops, Whistler and Ridge Meadows. These teams can be included in the cluster of teams already mentioned between 25 and 35 calls per year, and are similar in that they also compete for the top spot in that cluster. Notable that two of these are on Vancouver Island. The variability in the number of calls for the top two teams might have something to do with both Chilliwack and North Shore being long line rescue providers for other teams in the area. Any call where they are called to assist a nearby team counts as a call against their team. Being a long line provider in the busiest area of the province means there are probably a lot of calls from nearby teams. Now that I have the data for the past ten years, what kind of questions do you want answered? In the next few weeks I’ll try to answer them along with re-doing the frequency and geographical distribution analysis from two years ago. I have had feedback from a few more SAR groups that the numbers I am reporting are representative but not exactly spot on to the numbers they are tracking. The important thing to remember in this analysis is that averages are more important than year to year numbers, and long term trends are more important that slight variations. For example, the high standard deviations for some teams means that a high call volume in one year does not necessarily mean that the next year will be as high. This makes it hard to predict what resources will be necessary for the next year. SAR groups can use these numbers with other facts about their search area to better predict what the causes of these variations are. Peter, I got the numbers from the EMBC Incident Summaries and not from BCSARIS. BCSARIS is even harder to use and has no data export that I can find. I also know that BCSARIS does not represent all the SAR incidents (it should) — and until they have online task reporting linked to the BCSARIS database this will never happen. You didn’t mention one interesting thing about your graph. What is the cause of purple line increasing sharply at the end? Not sure what you mean, is that the line for Golden SAR? 4 Pings/Trackbacks for "SAR Team call volumes in BC"